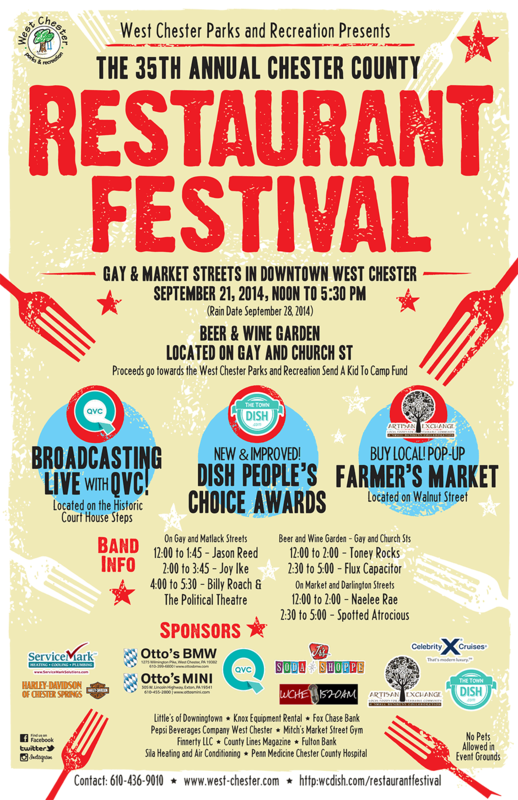 The 35th Annual Chester County Restaurant Festival, downtown West Chester’s biggest street festival is bigger than ever this year with continued expansion along Gay AND Market Streets. New events include a pop up Farmers Market, live broadcast by QVC featuring In The Kitchen with David. All this with more than 65 restaurants, 110 arts & crafts vendors, 3 stage areas for live music, and the Church Street Café where patrons can sit and relax with a pint of refreshing brew. The event is free to attend and will be held on September 21st from Noon until 5:30PM. See more information by visiting Chestercountyrestaurantfestival.com.